Managing your days through the homeschool years. Can you hear it? Are you "burning daylight?" If you have ever experienced a series of days, weeks or even months when you felt like you just could NOT get on top of all you had to do, you are not alone. Juggling homeschooling and homemaking can be challenging - or so we've heard! Whether you're struggling with managing your day, or simply looking for encouragement and fresh ideas for tackling your list of things to do, you will enjoy hearing from the heart of busy homeschool mom of seven, wife and author, Heidi St. John. You'll laugh out loud, learn some of Heidi's favorite tips on everything from home organization to meal preparation, and discover how you can homeschool in freedom and joy. Are you ready to be encouraged? Then join Heidi in discovering that real moms sometimes serve cereal for dinner - and live to write about it! Heidi St. John has been happily married to her husband Jay since 1989. They have seven children and have homeschooled all the way through high school. 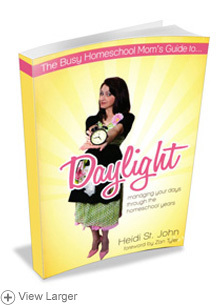 A favorite conference speaker, Heidi approaches homeschooling with humor and grace. 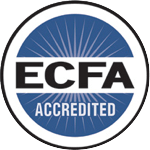 Jay and Heidi are also the founders and executive directors of First Class Homeschool Ministries, a parachurch organization dedicated to helping churches start homeschool cooperatives.